At Cersaie in Bologna last September I saw all kinds of amazing innovations and new products, many of which were making their world debut in Bologna that week. Worldwide, the tile industry is more properly known as the ceramics industry, and a large component of the world ceramics industry is bath design. 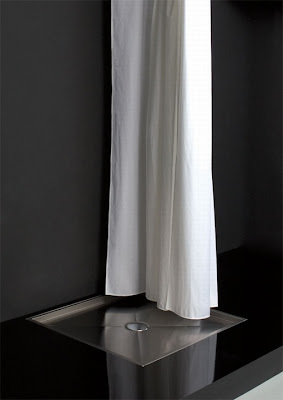 Two Italian manufacturers came up with interesting ways to deal with a shower pan this year and both companies are onto what I say is the next big thing in shower design. The first of these innovations is Rapsel's Pianolegno. I'm showing it here with their Pluviae shower fixture. By the way, Pianolegno means wooden floor in Italian and Pluviae is French for rain. The Pianolegno is a teak grid that fits into a stainless steel shower pan that's been countersunk into the floor. The pan looks like this and can also be used on its own without the teak inserts. Here's how it looked when I saw it at Rapsel's booth at Cersaie. It's been paired here with Rapsel's Cobra shower. Pretty slick. Check out the rest of Rapsel's wares on their website. Another great innovation I saw in this department is the Volo from Flaminia. Volo means flight for what it's worth. 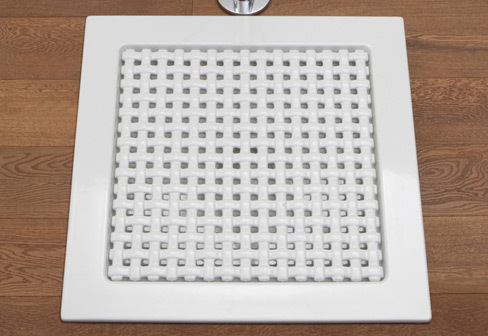 The Volo is a ceramic, basket weave grate that sits in a ceramic pan. That pan can be countersunk into the floor or it can sit on top of the floor. If it's sitting on the floor, it's make a small step up obviously. and here's a detail of the grate. Flaminia has an enormous collection of bath products and you can see them on Flaminia's website. Granted, these two products are still kind of edgy to North American eyes, but could you ever see using something like this in your own home? Does the idea of a shower without a curb, meaning it's flush with the floor appeal to you? Very nice post and photos. These floor drains are very interesting and they are so much nicer than the small drains that are customary presently in most places today. 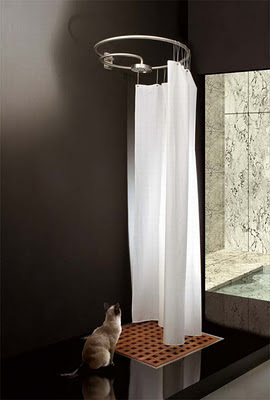 It kind of reminds me of an outdoor shower- which I happen to love. Maybe that's the reason I like them so much. I love outdoor showers too. 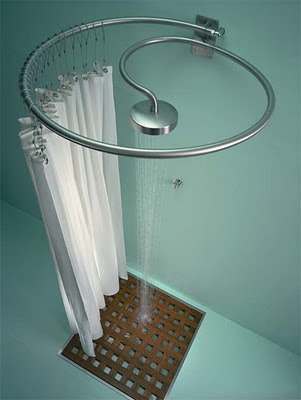 How practical are showers like this? I think the concept is very cool and funky, but would overflow and spilling ever become and issue? Maybe not since the drain is so large. They're not going to work with a typical US bath with typical US water pressure, unless they're going into a wet room or if the shower enclosure seals off completely. They're a departure from the usual way to think about showers and that's why I think they're so cool. Many if not most baths in Italy are wet rooms and the whole floor would pitch slightly downward toward a shower pan like this. I love all of these. I really think my favorite images each week com from this blog. I LOVE your style!